Southern exposure meets resort style living, in this custom built riverfront home. An entertainers delight! Enjoy the wrap around views overlooking the resort style pool and spa. A few steps away is your dock with two 20, 000 pound boat lifts, tiki huts and jet ski lift. 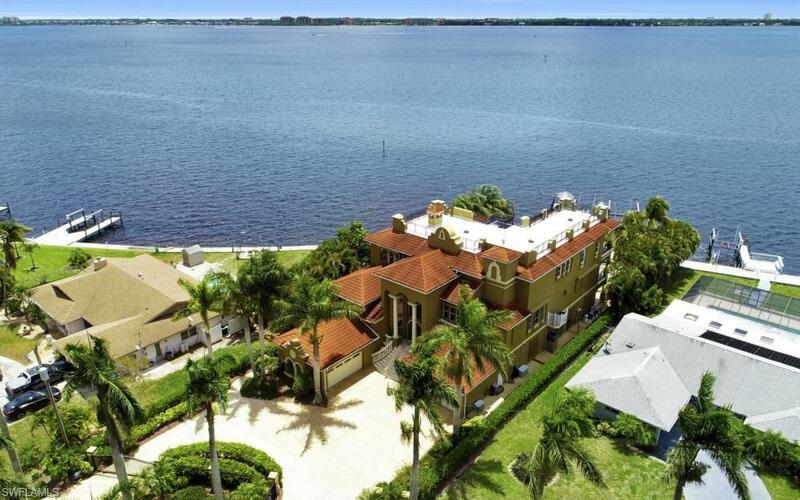 All at the mouth of the Caloosahatchee River, and minutes to the Gulf. Relax in the privately gated home, free of all HOA fees and live in this highly desired neighborhood, lined with beautiful Royal Palms. This home has the finest upgrades and features inspired by the owner. Walk in the Grand Entry and be mesmerized with the custom millwork, columns, ceilings and views galore! Come up into a spectacular two story library, where you can relax, listen to music or read a book by the marble fireplace...and it doesn't end there! The endless features of this home include: an elevator, storm shutter, sonos music system inside and outside, exercise room with sauna, billiard room with custom bar and wine cellar, four car garage with a separate motorcycle garage, along with two full size generators!